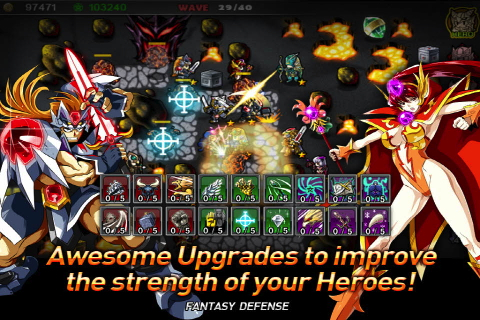 Fantasy Defense is a fun iOS game developed by PLAYBEAN that fuses tower defense with elements common to Japanese role-playing games (JRPGs) and RPGs in general. The Fantasy Defense app costs $0.99, requires iOS 4.2 or greater, and works as both an iPod touch and iPhone app. For the purposes of this review, we played Fantasy Defense on an iPhone 4S. For those unfamiliar with the tower defense genre, the basic concept is that you defend a map by placing stationary defenders in optimal positions. Each map has an entry point and exit point, and you defend the map by destroying a unit before it reaches the exit point. Each time a unit does reach the exit point, the player loses health, and when they’ve lost enough of it, the game is over. Rather than turrets and lasers, as in most tower defense games, Fantasy Defense provides you with warriors, archers and wizards, and each unit has two standard upgrades plus a special upgrade. The Warrior does a lot of damage, but only in close proximity. He can upgrade to a Knight and a Warlord, and he can become a Brandisher, which stuns enemy units, slowing them down. The Archer does little damage, but he can attack very fast and over long distances. He can upgrade to a Splatter and then a Sky Arrow. He can also become a Holy Eye, which is an archer that sacrifices speed and distance for damage over time. The third unit is the Wizard, which upgrades to Sorceress and then Blaster. The Wizard is similar to a laser turret in some tower defense games, and she’s particularly effective against certain units. The special upgrade for the Wizard is the Ice Mage, which freezes opponents, and works well in combination with Warriors, Knights and Warlords. There’s also the hero element, which is reminiscent of the Heroes of Might and Magic series. The hero defends the gate, which is this program’s version of the map’s exit point. Heroes have five class levels per game level that they progress through, and each time you level, you can upgrade damage, attack speed and so forth. Heroes also earn hero points, and these carry through from one level to the next. The player can spend hero points on unit upgrades as well as weapons and armor for the hero. 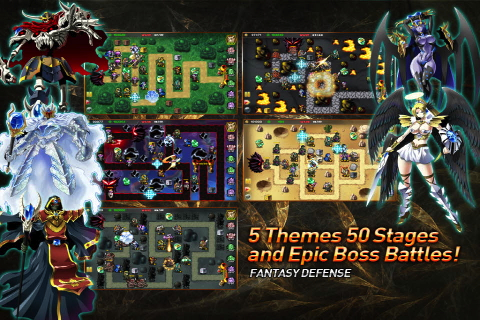 Fantasy Defense includes 50 stages in five distinct environments, and it has three modes: normal, infinite and destroy. The “destroy” mode is neat because the app gives you the opportunity to destroy your opponent’s gate. In the “infinite” mode, you play until you die, and trying to beat your high score really adds a lot of replay value for us during this review and beyond. The graphics are a little lackluster by current standards, but the application overcomes that. We should mention that Fantasy Defense has a reputation for crashing, particularly on iPod touch and iPhone devices with the lowest specs. However, as an iPhone app on the 4S, we played it for an extended period without one crash, so it may just be a memory issue on older devices. AppSafari review of Fantasy Defense was written by Darius Reimm on March 5th, 2012 and categorized under App Store, Games, iPad apps, RPG, Tower Defense, Universal. Page viewed 5315 times, 1 so far today. Need help on using these apps? Please read the Help Page.